Two favorite fall flavors combine in these perfectly spiced gingerbread cookies with a velvety-smooth apple butter center. So you've made a bunch of homemade apple butter - now what to do with it? 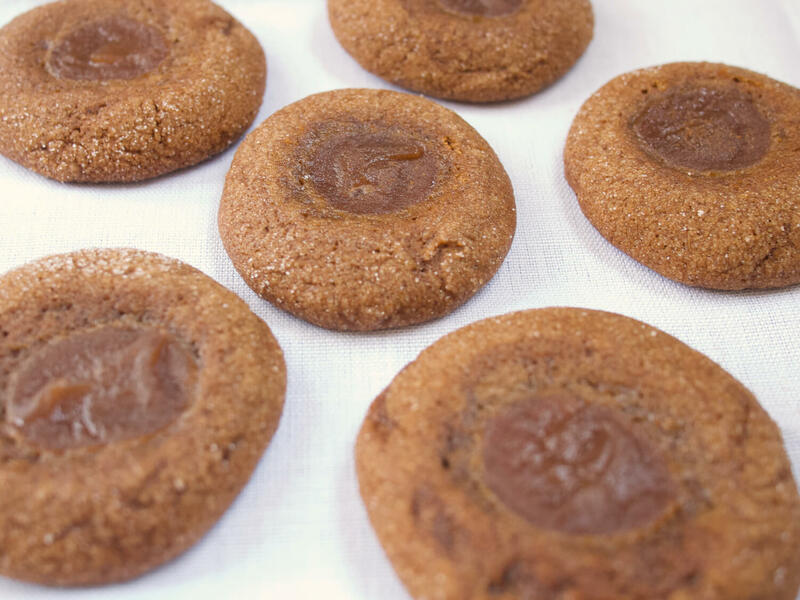 These gingerbread thumbprint cookies are a good answer. The spices and molasses of the gingerbread dough go perfectly with the sweet-tart flavor of the apple butter baked into the center. The apple butter also ensures that the middle of these cookies will stay tender and soft while the edges crisp up. Whisk together flour, salt, baking soda, and spices in a medium bowl. Using a stand mixer or a hand mixer with a large bowl, beat butter and sugar together until smooth and fluffy, 2-4 minutes. Scrape down sides of bowl and beat in molasses until combined, about another 2 minutes. Scrape down sides of bowl and add eggs and vanilla, beating until combined. Add half of dry ingredients to mixer bowl and mix on low speed until just incorporated. Scrape down sides of bowl and add remaining dry ingredients, mixing on low speed until no streaks of flour remain. The dough will be thick and slightly sticky. Cover bowl with plastic wrap and refrigerate for at least 1 hour, or up to overnight. To bake cookies, heat oven to 350°F and line a cookie sheet with parchment paper or a silicone baking mat. Using a tablespoon measure or small cookie scoop, portion dough into 1-inch balls, rolling them between your hands to smooth. Pour some granulated sugar onto a small plate and roll each ball in sugar before placing on the cookie sheet, leaving 2 inches of space between each ball. Using the back of a ½ tsp. measure, press an indentation into each ball, going about halfway down through each cookie without cracking the edges of the cookie too much. Scoop ½ tsp. of apple butter into each indentation and smooth over slightly. Bake for 11-13 minutes, or until cookies are puffed and just beginning to darken around the edges. Let cool on the pan for 10 minutes before transferring to a rack to cool completely. Repeat process with the rest of the dough. Cookies will keep in an airtight container at room temperature for 2 days - any longer than that and they’re best refrigerated due to the apple butter. Makes around 2 dozen cookies. Perfectly spiced apple butter is made easy with the use of a slow cooker. A perfectly spiced cake from writer Laurie Colwin makes for a simple dessert at the end of a meal or a perfect accompaniment to tea or coffee. A flavorful fall soup comes together easily thanks to a can of pumpkin puree. Here's a warming, healthy breakfast that feels indulgent, all because of the power of the runny egg yolk.